Save on your shopping with a supermarket cashback app. And get free Green & Black’s chocolate – more details at the end! After grappling with a fistful of supermarket vouchers yesterday, on day 4 of my October savings challenge I switched to my smartphone instead. Now, I was late to the smartphone party, so I only discovered the money saving potential of shopping apps pretty recently. In fact, I only switched from my elderly Samsung “it makes calls and texts, why would I want anything else?” handset earlier this year. Since then, I’ve become positively evangelical about smartphones, and my husband rather regrets encouraging me to get one. Mwahahaha. paying out for the handset and monthly bills. 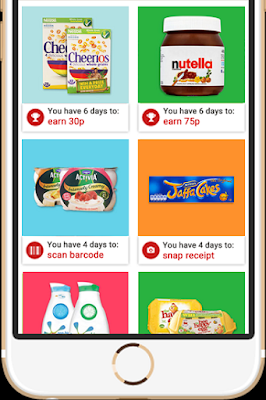 Instead of carting round paper vouchers to save money on your supermarket shopping, you can tap into discounts via your smartphone. Apps like CheckoutSmart and Shopmium offer cashback on assorted supermarket goodies, from pasta to peperami via booze, toiletries, cleaning products and rather strange yogurt. The apps all work in fairly similar ways. Basically, you browse the deals by supermarket, decided if you want to buy anything, track it down and haul it home (ideally after paying first). Then use the app on your smartphone to scan the barcode, take a photo of your receipt, submit it all via the app, and kerching, claim your cash. If you cook from scratch, and tend to buy own brand and value range foods, you won’t find many offers relevant to you. Realistically they are mostly fancy brands of snacks, processed food, toiletries, cleaning products and booze. CheckoutSmart seems to have more “free” offers, where you get cashback worth the entire purchase price. Ideally, browse the offers in the comfort of your own home, rather than waiting until you’ve hit the coverage black hole at the back of your local supermarket (although maybe that’s just Hadleigh). Do check exactly which products are on offer. Make sure you match the right combination of pack size, flavour and brand, otherwise you’ll miss out on any cashback. Don’t expect to find all the products on the shelves. Often, the cashback is designed to tempt shoppers to try new products or strange brand extensions. Sometimes the supermarket will hae decided to steer well clear. Double up the discount where possible. Look out for cashback offers on products that are already on special offer at the supermarket. For example, I occasionally buy Lloyd Grossman pasta sauces if they’re on offer. If I see the app pays cashback on the same sauces, I’ll check if they are already being sold half price, and get the cashback on top. Try not to get lured into making more expensive purchases just because you can get a chunk of cashback. That’s how I ended up with a jar of Bonne Maman blackcurrant jam, nice though it is. Unfortunately, you can’t use cashback apps on short-dated yellow-stickered food, which is pretty much the only time I buy the Hovis or Kingsmill bread that pops up on the apps. Boo. Brace yourself for the process of submitting receipts taking longer than expected. Finding the right light, laying a crumpled receipt out flat, getting bossed around by the app for not holding your phone straight, having to take several pictures of sections if it’s a long receipt, waiting while it gets submitted – it can take a while. Get your receipts in quick. The offers only last for a few days, and if you submit a receipt that’s too old, the apps will reject your cashback. If I scan the barcodes while I’m in the supermarket, I’m more likely to remember to send in photos of the receipt. Be prepared to fill in a help ticket, or email customer service, if the bar code won’t scan or for some reason the app refuses to recognise your receipt. The Shopitize app is much better than it used to be – if it has problems recognising your receipt, after two attempts it will automatically send the case for review. If you claim any cashback, best to be on the safe side, and transfer any earnings promptly out of the app and into your bank account or Paypal account.Otherwise, if the company running the app goes to the wall, it’ll take your cash with it. Watch out for minimum payouts. Some apps won’t let you take your 20p cashback and head for the hills, but insist you earn over a certain amount before you can get your hands on it. It’s safe to say that cashback shopping apps aren’t going to make me millions any time soon. If all this seems a bit of a faff, fair enough. However, in my case, I earn the odd 25p here and 40p there on basics like milk and veg that I’m buying anyway. I was pleased to get cashback on the box of Kellogg’s cornflakes I bought to get a free ticket to the Sea Life centre in Weymouth this summer. However, I fear I’m a hopeless candidate for shopping apps hoping to encourage me to try new things. I did lash out on discounted Pringles, a Muller fruit corner, Ribena and the Bonne Maman jam when I was first playing around with the app, but it’s not as if I’d never tried them before. As part of the October savings challenge, I claimed 25p on milk I bought from the Co-op, and remembered to submit the receipt for 20p off broccoli bought last week. I then asked to redeem the £10.60 I’ve earned with Shopitize since signing up six months ago, and bunged it into my savings account. That’s a chunk towards the £100 target. All these small daily changes do add up over time! Free Nutella if you sign up for Shopmium! When I first wrote this post, Shopmium was willing to hand out free Green & Black’s chocolate. Nowadays (January 2019) you can claim a free jar of Nutella instead. Just sign up for Shopmium by downloading the app on your phone (not via the website! ), bung in your email, then enter the referral code KFKKAMKL to get free Nutella. Unfortunately, it’s not delivered by wi-fi, you actually have to go and buy a jar within 8 days, scan the barcode, snap a photo of the receipt, and get the cashback transferred to your PayPal account or bank account. So maybe you’d rather spend the money and sod the cashback app. But still. Great on toast. And pancakes. Or waffles. Mmmmmmm. Save more: £10.15 from balance tidying my current account. Still no £2 coins in change. 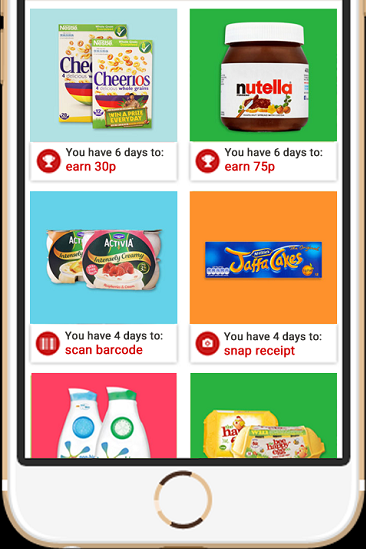 Earn more: £10.60 as above, from withdrawing the money earnt using the Shopitize supermarket cashback app. Any tips for making the most of supermarket cashback apps? Chance to earn money for nothing, or too much faff for too little? I’d love to hear! I just put up with scanning the receipts although it is a faff. Like you, unless it works out as a freebie, or nearly so, I don't buy things just because it gets cashback because we cook most things from scratch. But by the end of the year there will be a nice little sum which is mine, all mine. Wow that Quidco milk cashback is a good deal, thanks for the tip. We get through a lot of milk in my household! Glad you're salting away a nice little sum without having to spend a lot on stuff you wouldn't normally use.